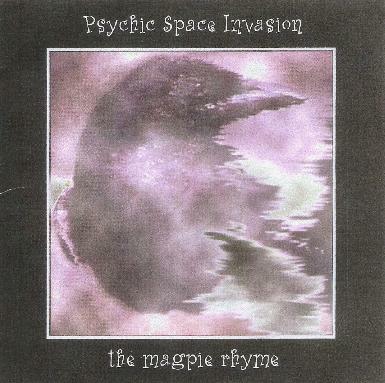 Psychic Space Invasion - "The Magpie Rhyme"
From Wales, United Kingdom, Psychic Space Invasion is Ian Holloway and The Magpie Rhyme is his fifth album. DANNNNSH (7:20) - Pre-recorded vocals? A training tape? Drones, effected out slowed down drum machine. It's starting to make sense, the slowed down vocal mixed with drones and slowed down drums somehow fits together and now I'm slowed down. WHERE THE PRETTY BIRDS SING (8:12) - Clicking with effects, and more clicking, then spacey gurgle howl along with clicken and then some heavy overdrive growl. Some nice panning (going from one speaker to another). But what does it all mean? Who are these Pretty Birds? Are these Pretty Sounds really the Pretty Birds and if so what are they trying to tell us? More and more crazy sounds. Demented, laughing, zippin' around Star Wars sounds. This is pretty cool music. Definitely psychedelic! (whatever that means) 50 PENCE FOR BUDDHA (11:34) - Intense layered drones, glass clankin', nice sound, more effective panning. Oh my, the glass is breaking. I seem to be losing my mind again. Is this weird music just for the sake of making weird music or is it art, that's the question. BIGGER TIME MIND (9:25) - Starts with big cool sound, a squalling squall, and more and more of it. At 3:24 it changes pace. Slow percussion, then some static and stuff... then some Big Band records? Oh my, what's it all mean?. Ian can ride the awesome drone. A LOVE, A WIND (9:01) - Electronic train goin' down the experimental tracks. Dark, moody, unidentifiable sounds. Demented laughing, or a duck barking? Demonic Donald Duck? Changes gears, more goin' down the train tracks, squealing and squalling vocal effects. MADE FROM ASH (10:34) - Slow, moody effects, nice feel, but in some ways this CD could be more engaging if there was less sameness. More to set it apart from other CD's of this genre. More nice squalls of sound. ON A WHISPERING SOUTH WIND (8:17) - Dog whistles? Gloomin drum machine, more dreamy dronage... the answer is Yes, it might just be weird music for sake of making weird music, but it's art!